March 2019: Fresh starts and fond farewells! Fresh starts and fond farewells! In the show this time, we talk to Joe Callingham about his work with colliding wind binaries of massive stars, Michael Wright rounds up the latest news, and we find out what we can see in the March night sky from Ian Morison, Haritina Mogosanu and Samuel Leske. This month in the news: the Japanese Hayabusa 2 probe, Israel's Beresheeft lunar craft, and a fond farewell to Opportunity. Firstly, The Japanese Hayabusa2 probe has completed an important stage of its mission. The spacecraft was designed to return a sample of material from an asteroid (162173 Ryugu) to earth. This was a continuation of the original Hayabusa mission, which, after studying the a nearby asteroid called 25143 Itokawa, decended to its surface and collected tiny grains of material. This material was returned to earth in 2010 and lead to a large amount of interesting science , for example the composition of this material and the effect of weathering in space . However the original Hayabusa probe had a number of problems, one of the major things being that the sample collecting mechanism was faulty, a small amount of asteroid material was collected simply because it went into the sample horn when the spacecraft landed. This leads on to Hayabusa2, a second mission to do a similar job to the original spacecraft. The craft was launched in December 2014, reached the asteroid in 2018 and is expected to return to earth at the end of this year. It not only carries the ability to collect samples from the asteroid but also 4 small rovers with a selection of cameras, thermometers, spectrometers and other equipment. The craft also has remote operating equipment for use off the asteroid surface, such as a near infra-red and thermal infra-red camera. On Thursday 21st February the craft landed on the asteroid and on the 22nd a sample of material from the asteroid was collected. The way it was done was this. On the craft is a sampling horn, which can be used to collect material. When that touched the surface a small projectile (5g of tantalum) was fired into the asteroid and the resulting ejecta was collected. Another projectile will soon be fired and finally around March - April this year a larger copper projectile will be fired. There are a few interesting things about firing these projectiles compared to the result of the previous Hayabusa mission. Firstly the amount of samples collected should be far larger and hopefully have a greater range of sizes. Secondly the use of a projectile to break material off the asteroid means it is not only surface material being collected. This is especially apparent for the planned larger projectile. Next up, the Beresheet has lift off. This spacecraft is Israel's first lunar craft, aiming to make them the fourth country to put a lander on the moon. It is designed to be able to take high resolution images of the lunar surface as well as measure the magnetic field. The earth's magnetic field is due to its molten inside, which the moon does not have. However the moon likely was at least partially molten in the distant past, this follows from our best ideas of how stellar systems form. When rocks solidify from this state they retain some trace of the magnetic field which was around at that time. If Beresheet can measure the magnetic fields of a large number of lunar rocks and we combine that with our best ideas of the ages of lunar rocks this should allow scientists to improve our knowledge of the moons history. The major reason the launch of Beresheet is making the news though is how it is funded . The lander was made by SpaceIL, an Israeli non profit funded by a mixture of philanthropists and the Israel Space Agency. They partnered with Israel Aerospace Industries, owned by the government of Israel. The launching was performed by one of SpaceX's Falcon 9 rockets, with NASA providing support for tracking the craft . In other words, this lander had a far larger level of private investment than previous moon missions. This project still leaned on the support of government organisations, mainly that of Israel. However the idea, as well as the bulk of the development, were performed by SpaceIL, and the launch was performed by SpaceX. This was a private funded moon lander, made by a private non-profit, that has been built and now successfully launched. Previous to this moon landings have been performed only by the government efforts of powerful countries, the US, the Soviet Union and China, with private groups playing a supporting role in those efforts. Another interesting thing is the cost of this lander, the lander's estimated cost of around $100,000,000 is very cheap for a lunar craft and this has lead to some interesting compromises in terms of its technology. The lander is not expected to last a long time , largely because of the heat of the lunar day. One of the compromises was the lack of good thermal control on the lander which will likely limit its operation time. Finally in the news, a farewell to Opportunity. NASA's Mars rover. 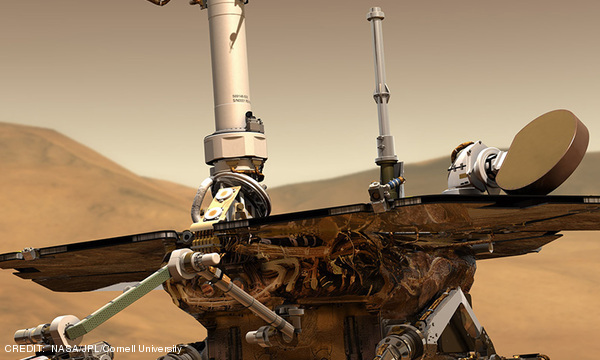 The rover first transmitted from Mars in 2004 and has far outlived its original goal of 90 days of work. However the rover fell silent after a planet wide dust storm last June and on Wednesday, 13th February NASA declared the mission completed and ended their attempts to communicate. While this is no doubt a sad moment for astronomy, with the loss of a much loved and very useful rover, it should be remembered just how incredible it is that Opportunity was around for so long. Over its life opportunity has studied the geology and atmosphere of Mars, largely working on characterising the rocks and soils of the Martian surface with a focus on whether there is evidence that water was once on the surface of Mars. In this work, Opportunity was very successful, finding many geological features that support the idea of Mars having surface water in its history. For example patterns in the rocks of the Martian surface that resemble those formed by liquid rather than wind on earth, and the presence of chemicals such as sulphates in Martian rock which on Earth are generally created in areas with standing water . There is a wonderful wiki article explaining the evidence gathered in this mission for further reading. Laura Driessen talks to Joe Callingham, a postdoctoral fellow at the Netherlands Institute for Radio Astronomy (ASTRON), about his work on so-called colliding-wind binaries. These systems are seen across the electromagnetic spectrum when outflows of gas ejected by two massive stars interact violently. Joe also tells us about his work using LOFAR to look at stars at very low frequencies. Ian Morison tells us what we can see in the northern hemisphere's night sky during March 2019. The Early Evening March Sky The brilliant constellation of Orion is seen in the south. Moving up and to the right - following the line of the three stars of Orion's belt - brings one to Taurus; the head of the bull being outlined by the V-shaped cluster called the Hyades with its eye delineated by the orange red star Aldebaran. Further up to the right lies the Pleaides Cluster. Towards the zenith from Taurus lies the constellation Auriga, whose brightest star Capella will be nearly overhead. To the upper left of Orion lie the heavenly twins, or Gemini, their heads indicated by the two bright stars Castor and Pollux. Down to the lower left of Orion lies the brightest star in the northern sky, Sirius, in the constellation Canis Major. Up and to the left of Sirius is Procyon in Canis Minor. Rising in the East is the constellation of Leo, the Lion, with the planet Saturn up and to the right of Regulus its brightest star. Continuing in this direction towards Gemini is the faint constellation of Cancer with its open cluster Praesepe (also called the Beehive Cluster), the 44th object in Messier's catalogue. On a dark night it is a nice object to observe with binoculars. The Late Evening March Sky The constellation Gemini is now setting towards the south-west and Leo holds pride (sic) of place in the south with its bright star Regulus. Between Gemini and Leo lies Cancer. It is well worth observing with binoculars to see the Beehive Cluster at its heart. Below Gemini is the tiny constellation Canis Minor whose only bright star is Procyon. Rising in the south-east is the constellation Virgo whose brightest star is Spica. Though Virgo has few bright stars it is in the direction of a great cluster of galaxies - the Virgo Cluster - which lies at the centre of the supercluster of which our local group of galaxies is an outlying member. Gemini - The Twins - lies up and to the left of Orion and is in the south-west during early evenings this month. It contains two bright stars Castor and Pollux of 1.9 and 1.1 magnitudes respectively. Castor is a close double having a separation of ~ 3.6 arc seconds making it a fine test of the quality of a small telescope - providing the atmospheric seeing is good! In fact the Castor system has 6 stars - each of the two seen in the telescope is a double star, and there is a third, 9th magnitude, companion star 73 arcseconds away which is also a double star! Pollux is a red giant star of spectral class K0. The planet Pluto was discovered close to delta Geminorum by Clyde Tombaugh in 1930. The variable star shown to the lower right of delta Geminorum is a Cepheid variable, changing its brightness from 3.6 to 4.2 magnitudes with a period of 10.15 days. Leo The constellation Leo is now in the south-eastern sky in the evening. One of the few constellations that genuinely resembles its name, it looks likes one of the Lions in Trafalgar Square, with its main and head forming an arc (called the Sickle) to the upper right, with Regulus in the position of its right knee. Regulus is a blue-white star, five times bigger than the sun at a distance of 90 light years. It shines at magnitude 1.4. Algieba, which forms the base of the neck, is the second brightest star in Leo at magnitude 1.9. With a telescope it resolves into one of the most magnificent double stars in the sky - a pair of golden yellow stars! They orbit their common centre of gravity every 600 years. This lovely pair of orange giants are 170 light years away. Ursa Major The stars of the Plough, shown linked by the thicker lines in the chart above, form one of the most recognized star patterns in the sky. Also called the Big Dipper, after the soup ladles used by farmer's wives in America to serve soup to the farm workers at lunchtime, it forms part of the Great Bear constellation - not quite so easy to make out! The stars Merak and Dubhe form the pointers which will lead you to the Pole Star, and hence find North. The stars Alcor and Mizar form a naked eye double which repays observation in a small telescope as Mizar is then shown to be an easily resolved double star. A fainter reddish star forms a triangle with Alcor and Mizar. Jupiter, starts the month rising around 2 a.m. and brightens from magnitude -2.0 to -2.3 as the month progresses whilst its angular size increases slightly from 36.2 to 39.7 arc seconds. By month's end it rises by ~1 am BST so will be higher in the sky before dawn. Sadly it is heading towards the southern part of the ecliptic and currently lies in the southern part of Ophiuchus just above Scorpius. By the end of March, it will lie almost due south as the Sun rises but will only have an elevation of ~14 degrees so atmospheric dispersion will blur its image somewhat. The use of an atmospheric dispersion corrector will help to give sharper images. Saturn, shining with a magnitude of +0.6, rises two and a half hours before the Sun at the start of the month some 2 hours after Jupiter. Its disk is ~16 arc seconds across and its rings - which are still 24 degrees from the line of sight - spanning 35 arc seconds across. Sadly, Saturn now to the left of the 'teapot' in Sagittarius is now at the lowest point on the ecliptic and so will only have an elevation of ~10 degrees when due south before dawn in a month's time. So, like Jupiter, an atmospheric dispersion corrector could help. Mercury, with an angular size of 7.7 arc seconds at the start of March, reached its greatest elongation east on the 26th of February, then 18 degrees away from the Sun. On the first of March, it sets some one and a half hours after the Sun shining at magnitude +0.1. During the month, its angular size increases to 10.9 arc seconds but its brightness rapidly reduces and by March 6th, at magnitude 2, will become very difficult to spot in the twilight. Binoculars could well be needed to reduce the background glare, but please do not use them until after the Sun has set. Mercury passes between us and the Sun (inferior conjunction) on the 15th. Mars, though fading from +1.2 to +1.4 magnitudes during the month, remains prominent in the south western sky after sunset at an elevation of ~37 degrees. Mars is moving north-eastwards through Aries and passes into Taurus on the 23rd/24th of the month. (If only it could have been at this elevation when at closest approach last year!) Its angular size falls from 5.3 arc seconds to 4.7 arc seconds during the month so one will not be able to spot any details on its salmon-pink surface. Mars, begins March at a magnitude of -4.1. with its angular size reducing from 16 to 13 arc seconds during the month as it moves away from the Earth. However, at the same time, the percentage illuminated disk (its phase) increases from 72% to 81% - which is why the brightness only reduces from -4.1 to -3.9 magnitudes. Venus rises abour 2 hours before the Sun at the beginning of the month with an elevation of ~7 degrees before dawn, but both reduce as the month progresses. We have nearly come to the end of its morning apparition as it moves towards superior conjunction (behind the Sun) in August. It will not then be visible, low in our south-western sky, until late November. March 2nd - before dawn: Venus, Saturn and a thin crescent Moon. Looking southeast before dawn and if clear, a thin crescent Moon will be seen lying between Venus and Saturn. March 12th - evening: a waxing Moon approaches the Pleiades and Hyades clusters. Looking high in the southwest during the early evening one will, if clear, spot the Moon lying below the Pleaides and Hyades open clusters in Taurus. March 16th - just before dawn: Jupiter and Saturn above the 'teapot' of Sagittarius. If clear just before dawn, and given a low horizon just east of south, one should be able to see Jupiter lying up to the right of Saturn above the 'teapot' of Sagittarius. March - Evenings of the 14th and 28th: The Straight Wall on the Moon. The Straight Wall, or Rupes Recta, is best observed either 1 or 2 days after First Quarter or a day or so before Third Quarter. To honest, it is not really a wall but a gentle scarp - as Sir Patrick has said "Neither is it a wall nor is it straight!". Haritina Mogosanu and Samuel Leske tell us what we can see in the southern hemisphere's night sky during March 2019. Highlights The planets are almost gone from the evening sky, but look up in the early hours of the morning and you will see Jupiter, and later on, Saturn and Venus. Te Tawhiti - the Pleiades are preparing for their journey to the underworld, leaving behind a doppelganger, the Southern Pleiades. We will see M45 again at the end of June when they will reappear in the morning sky as Matariki. The Milky Way arches across the sky reaching zenith in the evening hours. There are some amazing binocular objects there, stay with us for our Southern Hemisphere Night Sky in March with Hari and Sam from the Middle of the Middle Earth, here in New Zealand. Kia Ora from New Zealand, Hi everyone, Once again we are at Space Place at Carter Observatory holding Galactic Conversations from the heart of Wellington in the Southern Hemisphere, with the music of the amazing Rhian Sheehan in the background, our Wellingtonian star composer. I'm Haritina Mogosanu, and I'm Samuel Leske. Just look up after sunset - pray that there is clear skies and you will see one of the most amazing night skies in the world. We've also been to a few star parties lately and had the opportunity to observe all night long these amazing features that set the sky of the Southern Hemisphere in a special place in our heart. Right now, the galactic centre is slowly coming back into the picture but there are still amazing views in the Carina-Southern Cross region and the Large Magellanic Cloud. So to get your own star party going, We prepared some instructions for looking up in March. Planets. There are no decent planets in sight in the evening sky, just Mars and that is so close to the horizon that you can hardly distinguish it from the stars and by 10 AM it's sunk into the underworld. So if you really want to see planets you will have to stay up late. The brightest stars in the night sky are there in March, so if you'd like to know what those lights are, we will tell you all about it. March is the month when the day is equal to the night, as we are observing the March Equinox on Thursday, 21 of March. Equinox. Oh yes it is indeed autumn here in Wellington and the days will become shorter than the nights after the equinox. At the beginning of the month, the Sun sets around 8:30 PM and earlier and earlier every day as we are heading towards the end of the month when it will set around 7:40 PM. At nightfall, half of our galaxy, the Milky Way, arches across the night sky from North to South, like the arm of the octopus. Wellington and New Zealand have a legendary octopus they talk about, Te Wheke o Muturangi. This octopus stole the bait and the fishooks of Kupe, who lived in Hawaiki; a chase across the Pacific Ocean followed and New Zealand was re-discovered again, as it was first found by Maui according to the Polynesians. Kupe's wife, Hine-te-Aparangi saw a long cloud in the distance, a sign that land was near and she named it Aotearoa, land of the long white cloud. And cloudy it can get sometimes! Stars. And talking about Maori star lore, at the fringe of our milky city of stars, Milky Way, on the north-western horizon, the Pleiades, the Shining Ones (Te Tawhiti) are preparing for the journey to the underworld. They are to disappear shortly behind the Sun and will stay there for a while. They will reappear in the morning sky in June after the longest night as Matariki, the eye of the Ariki, star cluster that marks the Maori New Year. Maori have different names for the same stars at different times throughout the year, and the Pleiades get to have three names throughout the year, in different seasons. Also shining, Sirius and Canopus reach the meridian almost in the same time, at the beginning of the month around 9:30 PM, by the middle of the month, the same stars reach meridian around 8:30 PM, and 7:30 at the end of the month. It is really impressive how fast they shift in the sky, as the Earth revolves around the Sun, and we can see this movement, in just one month. To see them in the same spot, we need to look two hours earlier at the end of the month compared to the beginning of the month. One is North of Zenith (overhead) and the other one south of Zenith. In the meantime the Southern Cross will be at the nine o'clock position on the South Celestial Circle. The Southern Cross is a circumpolar asterism, it never sets, nor rises from this latitude, only gets washed away by the light from the Sun. High in the sky, Canopus marks the midpoint between the center of our galaxy and its edge. The brightest stars in the night sky are featuring from North To South - Aldebaran from Taurus, Castor and Pollux in Gemini, Canis Minor, Orion's stars, Canis Major, these are north of overhead then south of overhead Canopus, Carinae stars: The False Cross, the Diamond Cross and the Southern Cross, and last but not least, Alpha and Beta Centauri, the pointer stars. Staying on the southwest part of the sky and halfway through from the horizon is Achernar. Fomalhaut is now gone, grazing the southern horizon. And on it's way to the Northern Hemisphere, the Large Magellanic Cloud is high. Some binocular objects. From the horizon and travelling up the Milky Way, well sort of, first we come to M83, the Southern pinwheel, a large face-on spiral at magnitude 7.09, nearby is the Sombrero Galaxy at 8.12 mag, then closer to the Southern Cross is Centaurus A at 6.64 mag, very close to Centaurus A is the huge globular cluster Omega centauri and we can't look at Omega Centauri without also taking in the beautiful 47 Tucanae just by the Small Magellanic Cloud. The Magellanic Clouds are exceptional binocular objects. The Magellanic clouds are our neighbouring galaxies, circumpolar here in Wellington and always a little elusive to direct sight. The Magellanic clouds are the best training objects for averted vision, always try to see them with the edge of the field of view of your eye while pretending you're looking at something else. The Beehive Cluster in Cancer is another amazing object, very bright, and we are lucky to share that with the Northern Hemisphere. Then there is of course, M42 in Orion, which we also share with the Northern Hemispherians. Also reasonably high in the sky, well high enough to see ok is 'The Leo Triplet', made up of M65, M66 and NGC 3628 galaxies. The majestic globular cluster of M3 is at 20 degrees above the horizon in the Northern part of the sky. Also down in the lower part of the sky is the stunning Black Eye galaxy at 23 degrees above the horizon. Unfortunately the Virgo cluster is only 15 degrees above the horizon, so not really clearly visible. The bottom star of the big dipper, Alkaid grazes the northern horizon early in the morning just before sunrise, precisely marking north. If we could only see it..., but there's no chance, yet we know it's there. And same goes for the Whirlpool galaxy - that gets nearly two degrees above the horizon. The morning sky is however popular with the planets, as Jupiter rises around 1AM on the beginning of the month, (and at 11PM at the end of the month) followed by Saturn two hours later at 3AM and Venus at 4:00AM. Jupiter and Saturn are flanking the center of the Milky Way this time of the year. If the Galaxy stretches almost from North to South in the evening sky, in the morning, it would almost have rotated to appear as if it's lined up from East to West, with Jupiter and Saturn at the Eastern end and Sirius setting in the West. As they prepare for their journey to the underworld at the fringe of our milky city of stars, on the north-western horizon, the Pleiades, the Shining Ones (Te Tawhiti) leave behind a doppelganger here in the Southern Hemisphere, the look alike, fake twin that never leaves the sky. Higher up than the Southern Cross, the Diamond Cross carries this mirror image of the Pleiades called unsurprisingly the Southern Pleiades. Circumpolar to Wellington, the Diamond Cross can also be found by climbing up the milky river, two thirds from the side and one third from the center this is where you will find the optical asterism (pattern of stars) of the diamond cross. At the eastern end of it, a pair of binoculars will reveal 'the Southern Pleiades', which at first sight look like the letter M to me. Theta Carinae cluster, also called the 'Southern Pleiades' has an astronomical resemblance to the famed northern star cluster M45 in Taurus. Even though the cluster is NOT dipper-shaped like the Pleiades, is also easily visible with the naked eye, (but best in binoculars), quite young about 30 million years old and at almost the same distance from Earth (500 light years away). And just like M45, the Southern Pleiades is 15 light years across. There's a smorgasbord of amazing objects that you can in the Southern Sky, we are lucky here in Wellington to be able to share many of the objects that are famous in the Northern Hemisphere as well, the benefit of not being too far South. We hope you get a chance to get out there and enjoy feasting the sights of the night sky. If you're in Wellington come up to Space Place, we'd love to show you around. So Clear and dark skies from Space Place at Carter Observatory here in the southern hemisphere. Special Thanks go to the amazing Rhian Sheehan, Space Place at Carter Observatory. Josh looks back over the saga of the potential discovery of an exomoon around Kepler 1625b. Is this discovery real, or is it so reliant on very specific conditions being met that it is statistically unlikely? We pour over the various publications on the exomoon and give our thoughts along with a story of science being done right. The LOFAR Two-metre Sky Survey (LoTSS) has recently been the subject of a special issue of the Astronomy & Astrophysics journal. The international team of over 200 astronomers (including some of our own from Jodrell Bank!) report the results of only the first two percent of the survey, yet they've discovered over three hundred thousand new objects in the radio sky. We discuss what it takes to undertake such a survey and some of its many interesting results, including probing intergalactic magnetism and the physics of black holes. A team of astronomers at Maynooth University, led by Professor Peter Coles and including Prof. Chris Lintott, have established the Open Journal of Astrophysics, an overlay journal to provide peer-review to open-access publishing. We take a look at a recent guest post at Prof. Coles' blog, In The Dark, in which Dr. Syksy Räsänen of the University of Helsinki (one of the first to publish via OJA) lays out the reasoning behind overlay journals. With scientific publishing having become a multi-billion pound industry selling to a captive market, this could offer a chance to break the existing model, in conjunction with open access routes like the arXiv, and save more money for science. STOP PRESS: As this episode was being released, the University of California have announced that they are cutting ties with the publishing giant Elsevier after negotiations fell through (in part on the issue of open access), saving the institution $11 million USD per year. The School of Earth Environmental Sciences of the University of Manchester have a new podcast on planetary science. Do check it out here! Find their YouTube channel here.